Most people have heard of or used catnip on their cats. For many of our feline friends, catnip can produce a fun, hyper-excited reaction that results in a cat that's pouncing, chasing, rolling around, and feeling generally frisky. It can be fun to watch, and the cats seem to have a great time too. Do you know why cats have this reaction to catnip, why some of them don't seem to care about it, and that some other plants can have similar effects? 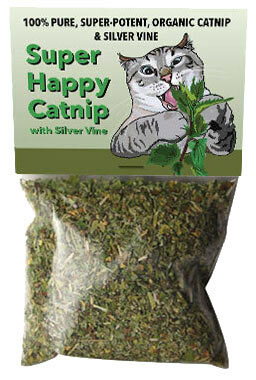 Catnip is the most widely used and well-known of the plants that can cause a mood change in cats. It is an herb in the mint family that grows in semi-arid regions. It was initially brought to America by European settlers and has been used to treat many different conditions in humans, including headaches and nausea. It's interesting that catnip seems to have a calming effect on most humans, which is the opposite of how it affects most cats. Scientists believe that the active ingredient which causes cats to react to catnip with excitement is nepetalactone. About 2/3 of adult cats respond to catnip, while 1/3 do not respond to it at all. Additionally, most cats do not react to catnip when they are kittens. Cats use the Jacobson's Organ (or vomeronasal organ) on the roof of their mouths to breathe in the scent of the catnip. Cats use that special scent organ often, and sometimes you'll see them sniffing something, then tipping their head back, mouth open, and inhaling. That brings the scent molecules of the item up into the Jacobson's Organ. From there, the scent messages are transmitted to the brain and, in the case of catnip, help produce its classic effects. Some cats can react to exposure to catnip by becoming aggressive. When you give your cat catnip for the first time, you should be aware that aggression is a possibility and observe from a distance until you see how he will react. If he does appear to be leaning toward aggression (his ears might lie back against his head, and he might be hissing or growling), give him some space and don't attempt to interact with him until the effects have worn off. You can learn more about catnip and cats here: "Fascinating Catnip Facts." Silver vine is a plant that many people have never heard of, but it can cause a reaction similar to catnip in some cats. In fact, up to 75% cats that don't respond to catnip do respond to silver vine. Silver vine grows in the mountains of Asia, and scientists think the compound actinide is the one that cats react to. It seems to have a similar but more intense effect in many cats as catnip does. One great way to use silver vine for your cats is to get a product that combines it with catnip, like this one: Super Happy Catnip with Silver Vine. You can learn more about this here: "Silver Vine for Cats." One specific type of honeysuckle, Tartarian, can produce catnip-like effects in some cats. It can also sometimes affect cats that aren't catnip responders. In particular, it is the bark or wood of the Tartarian honeysuckle bush that is used as a stimulant for cats. The berries and flowers can be toxic to cats when ingested. Therefore, cat toys containing honeysuckle don't smell like honeysuckle flowers. Additionally, while simply giving the cat a piece of Tartarian honeysuckle bark to lick and chew on can cause the desired effect, it can also damage the cat's mouth tissues and pose a potential choking hazard. Therefore, the honeysuckle wood should be encased in a cat toy or processed into a spray for safe use. You can learn more about honeysuckle cat toys here: "Honeysuckle: When Catnip Doesn't Create a Crazy Cat." Valerian root, like silver vine, contains actinide. 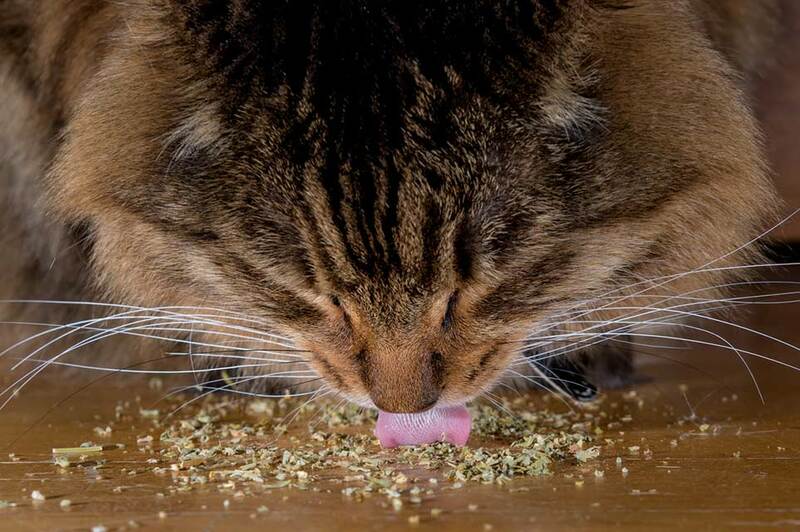 Many cats react to it in a similar way as they do catnip. However, it has an odor that most people find offensive. You might be able to find some cat toys that contain valerian root, but be sure they don't have any ribbons, buttons, strings, or small parts that might come loose and be swallowed by your cat, creating a dangerous situation. Why Give Your Cat Mood-Altering Herbs? You might be wondering why you should consider giving mood-altering herbs to your cat. These plants trigger your cat's olfactory system, resulting in the signs of playfulness and excitement that you see. This experience can be enriching for a cat, especially a house cat that is unable to run and hunt. It is crucial that you find and regularly use enrichment to reduce your cat's stress and boredom levels. Not only can doing so improve your cat's mental health, but it can also help reduce unwanted negative cat behaviors such as inappropriate urination and scratching. Keep your catnip, honeysuckle, valerian root, and silver vine products put away in between play sessions where your cat can't get to them. That way, they should continue to produce the desired effects when you bring them out. If you don't, you might find that your cat becomes immune to them.